The 3SAE Lens Forming Station (LFS) uses patented Ring of Fire Technology® to allow users to process a fiber end or cleave into a ball lens of a user specified diameter. Utilizing precision mechanics, integrated high contrast optics and automatic fiber alignment, the Lens Forming Station is the only commercially available system specifically designed for high-volume manufacturing targeting ease of use, high accuracy and process repeatability. The Lens Forming Station allows users to easily optimize a recipe to achieve a desired ball lens diameter utilizing 3SAE's glass processing control software by setting the target diameter and arc controls. Programmable pass/fail criteria including ball lens diameter, ball lens center and 3SAE's Effective Area Radius (EAR)™ measurement can also be adjusted on a per program basis. Additional limits can be set to ensure that a prepared fiber of a proper diameter is being loaded by the operator before allowing the process to begin. All adjustable parameters can easily be locked out, offering simple "one button" control to the operator while allowing ultimate customization of recipes from an engineer level. Real-time image processing allows the user to view the lensing of a fiber in process. When the lensing process is completed, the user is automatically alerted of pass/fail status based upon program specific criteria. 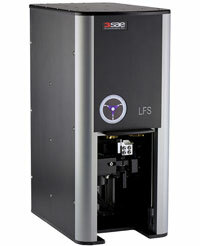 The 3SAE Lens Forming Station accommodates fiber diameters from 125 µm to 600 µm (clad O.D. ), coating diameters up to 900 µm. Patented Ring of Fire® repeatability and stability is ideally suited for manufacturing or large scale production. 3SAE proprietary-alloy electrodes couple extended life with high thermal power generation and low maintenance/cost. The electrodes generate negligible tungsten deposits and require no specialized shielding gas or external vacuum. 3SAE's Effective Area Radius (EAR)™ measurement displays the radius along the surface where the light exits the ball lens. Machine can be rotated to accommodate multiple applications. Optical: 2 Mega pixel, B&W camera with dual telocentric 2X lens and intensity controllable LED backlight. Alignment: Automatic X, Y & Z alignment, rotational fiber holder (theta) and fixed vacuum v groove. Control / Operation: Each system ships with PC system with Microsoft Windows 7 Operating System, Serial communication to 3SAE Lens Forming Station mother board, USB 2.0 video, LFS Executable Software and a 23? — 1920 x 1080 High res wide screen monitor.